Author’s Note: This article is the final installment of the three-part series on how to start your own nutrition business. In the first article, I discussed the pros and cons of starting a private practice and the skills and personality traits you need to succeed. In the second article, I provided strategies to find office space and reviewed the types of office space available as well as the furnishings and equipment you need. In this final article, I discuss ways to market and advertise your services to attract clients and build your business. Karen has come a long way. She’d always dreamed of starting her own nutrition business so she examined the pros and cons of starting a private practice and spoke with other RDs who have their own businesses to determine whether entrepreneurship was right for her. After examining her strengths and weaknesses and doing much research, she decided to go for it. Karen found a great location for her office and furnished her space with the equipment she needed. Now, Karen’s eager to begin seeing patients. The question is, where will these patients come from? You can have a unique approach to patient care or a special niche in the marketplace that will set you apart from other dietitians, but unless you let the public know who and where you are and generate referrals, your business likely will fail. To learn how to attract clients, Karen pored over books and periodicals about business that helped her develop a three-pronged approach. She realized she needed to build a network, market her practice, and gain publicity. But before she could begin, she needed to target her market. • Are there any RDs nearby in private practice? • Do the residents of these communities presently seek nutrition counseling? • Are they obtaining nutrition advice from a local health food store or a well-known weight-loss chain? If so, how much are they paying for services? • How can you set yourself apart from the competition? Once you answer these questions, you may conclude that specializing in geriatric nutrition is the best way to target your market. Sometimes, as luck would have it, your target market finds you. If you already have a clinical specialty as a hospital RD, you can build on those years of expertise as you start your practice. Another possibility is to begin specializing in an area of nutrition with which you’re most familiar. For example, if you have small children, you understand the challenges most families face when it comes to regularly preparing healthful meals. This can become a great niche. Merriam-Webster defines networking as “the exchange of information or services among individuals, groups, or institutions; specifically, the cultivation of productive relationships for employment or business.” True networking is somewhat of an art. The novice networker may believe that networking is as simple as meeting people and exchanging business cards, but there’s more to it. It involves building relationships in which you give and receive. Think of networks as people you know and clubs or organizations to which you belong. Some networks are professional and others are personal. Professional networks include other health professionals, dietetics and health organizations, and business and networking groups. Personal networks can include your children’s school or sports team, places of worship, civic associations, and relatives. However, it’s not enough to join organizations; successful networking requires active participation. Virtual social networks also are great tools for networking. These networks are growing rapidly and gaining in popularity. Electronic mailing lists and chat rooms are two examples that can provide multiple opportunities. Carefully choose which networks you’d like to join or you’ll run the risk of getting bogged down with trying to keep up with too many of them. Jan Patenaude, RD, CLT, director of medical nutrition for Signet Diagnostic Corporation, a medical laboratory that specializes in mediator release testing (MRT) for food allergies and intolerances, and coauthor of the Certified LEAP Therapist training and continuing education program, met the vice president of Signet by posting on a health message board. That post led to 1,000-plus private practice consultations via telecounseling, and she was able to help the vice president boost his business by introducing MRT and LEAP (Lifestyle, Eating, And Performance) therapy to RDs across the country. Before you begin your marketing campaign, establish the professional image you want to project, suggests Yvette Quantz, RD, CSSD, LD, CLT, of Customized Nutrition Newsletters + Design Services. “A professionally designed logo and business card along with a good website are your first impression, and they do count,” she explains. Advertising is a great way to get the word out about your practice. It can be expensive, but you need to spend money to make money. It’s important to present a professional image when advertising, so don’t skimp on design and layout in print media. You’ll want to carefully examine the cost benefit of all media before developing your advertising budget. Many RDs in private practice have found large newspaper, television, and radio ads the least effective and have turned to other formats, such as neighborhood newspapers and school or community newsletters. Printed brochures are inexpensive and a great way to market your practice. You can create your own brochures by simply using a good desktop publishing program. Your brochures should convey information about you and your practice and include your philosophy. You can distribute them at speaking engagements or doctor’s offices or send them as direct mail to your target market. Traditional newsletters fall under the direct mail category and are best used down the road when you’ve established your target market. E-newsletters, however, are an inexpensive way to advertise your services and stay connected to patients. “Sending a monthly, bimonthly, or quarterly newsletter will help people become familiar with you,” says Quantz , who often gets requests for appointments in response to her monthly newsletter. An essential tool for doing business, a website will give you and your practice credibility and allow potential patients to visit with you before they actually meet you. Some patients, when referred to an RD, receive several names to contact. They often make their decision based on Web presence, so creating a site that looks inviting and is easy to navigate is recommended. Your website also can become a time saver. Listing your location and office policies reduces the amount of phone time spent with new patients. You can direct them to your site for this information. It’s also beneficial to post new patient forms they can download and complete before the first visit. Start with a simple site and add pages as your business grows. Publicity is an additional way to get the word out about your practice. It differs from advertising in a couple of ways. Advertising costs money; publicity is free. Another difference is that advertising gives you the opportunity to control your message whereas publicity sometimes does not. For example, if you’re interviewed, a reporter can take your words out of context or adjust them slightly to fit into a story. Facebook, Twitter, Pinterest, YouTube, and blogging are incredible ways to gain exposure, establish name recognition, and gain publicity. The biggest investment is your time. It’s easy to get sucked in, and before you know it, hours have passed. So analyze the various options and be strategic as you determine how best to use social media to promote your business. Rebecca Scritchfield, RD, ACSM HFS, who has extensive social media experience, suggests you “look at your business goals and ask, ‘How can social media help?’” You’ll be able to determine whether a blog, a Facebook fan page, or a Twitter account is the best use of your time. Once you step into the social media realm, however, you can’t “just abandon your social media presence. Your intention should be to stay involved for the long haul,” Scritchfield says. Marketing your practice is a necessary, ongoing process to build and grow your business. “One of the best things I learned about a growing practice is to not only constantly build and get new patients but to nurture the relationships you’ve already built with existing patients by continuing to offer them services that could benefit them,” Quantz says. — Faye Berger Mitchell, RD, LDN, is coauthor of Making Nutrition Your Business: Private Practice and Beyond. She’s helped thousands of dietitians nationwide start their businesses through her workshops, speaking engagements, and Be Your Own Boss Starter Kit. 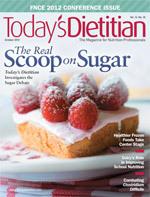 She’s the recipient of the 2011 Academy of Nutrition and Dietetics’ Excellence in Practice Award.